Lionel Manley Gaunce was born in Lethbridge, Alberta, Canada on 20th September 1915 and educated in Edmonton. He served in the Loyal Edmonton Regiment from 1933 to 1935 and then joined the RAF on a short service commission in January 1936 and was posted to 9 E&RFTS, Ansty. On 21st March he moved to 5 FTS Sealand and at the end of the course joined 3 Squadron at Kenley. 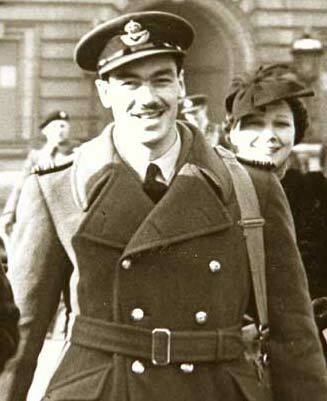 Appointed a Flight Commander in April 1939, Gaunce was posted to 615 Squadron in France in February 1940. 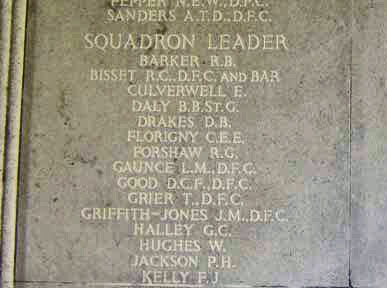 The squadron was withdrawn to Kenley on 21st May. He claimed Me109’s destroyed on 20th and 25th July plus another destroyed with one probable on 12th August. On the 16th August he damaged a Me110. He was shot down on 18th August by Me109’s after damaging one and baled out with slight burns. He was admitted to Holmesdale Hospital. His Hurricane, P2966, crashed into Hobsacks Wood, Sevenoaks Weald. Gaunce was awarded the DFC (gazetted 23rd August 1940). Back with the squadron by 26th August Gaunce was shot down in flames on this day after destroying a Me109 and baled out. He was rescued from the sea and taken to Herne Bay Hospital, suffering from shock. His Hurricane, R4111, crashed west of Herne Bay pier. destroyed, probably another and shared a Fiat BR20. He left 46 in December because of ill health and did not return to operations until July 1941, when he took command of 41 Squadron at Merston. Gaunce damaged a Me109 on 20th August, shared a probable Me109 on 21st August and damaged others on the 27th, 28th August and 17th September. He was killed on 19th November 1941, when he was shot down by flak into the sea off Janville while on a sortie to St. Lo. He was 25 and is remembered on the Runnymede Memorial, Panel 28. Gaunce's portrait was done by Cuthbert Orde in July 1941 (below). Mount Gaunce (7500ft., 2286m) in Jasper National Park, Alberta was named after him in 1949.